Answer: A Christmas coronation... and big data? Yesterday's questions were reasonably straight-forward (but fun!). And the SearchResearchers took time out of their Christmases to answer the questions. Well done! (2) What is that big-data analysis summary called? (4) when will the bells be rung at his coronation site today? 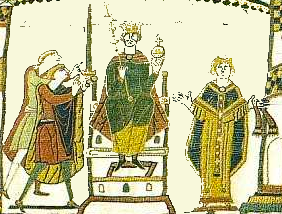 "On Christmas Day, 1066, [William the Conqueror] was crowned the first Norman king of England, in Westminster Abbey...French became the language of the king's court...the 'Domesday Book,' a great census of the lands and people of England, was among his notable achievements." Ramon did what I had done originally, and just asked about kings crowned on Christmas Day. I learned that the Domesday Book was a large-scale census and accounts-tracking effort by William. As the new king, he wanted to know what was his, and how much he could expect as income from his newly acquired lands. (And no doubt he also wanted to be sure that nothing got lost in the transition from Harald, the previous king, who he defeated at the Battle of Hastings in 1066.) Whether or not he actually commissioned the book, or if it was done by one of his deputies is still an issue--but it's pretty clear he wanted to get this data down. and learned that, as Rosemary discovered: "The Abbey ( a portion of it) had been built by King Edward between 1042-1052 (Wiki) for his own burial site and it is depicted in the Bayeux Tapestry (the most famous tapestry in the world. Paintings from that time period (William the Conqueror and the Coronation don’t appear to exist). Beautifully presented online so you can scroll across showing the history. You will see the Abbey with a man installing the weather vane which was to indicate it being recently built." Search lessons: Well, this was pretty straightforward. The only real leap of insight was understanding that a census could be considered as a "big data" project. That's the kind of terminological shift that you need to consider to solve many of the SearchResearch challenges. Next week, we'll be back onto more challenging challenges. Have a great closing of the year, and a delightful start to the New Year! P.S. A late update. I just noticed the wonderful videos that Fred pointed us to in his answer. They're definitely worth checking out (especially if you teach history to kids). William the Conqueror by the History Teachers. Although Fred's favorite is Black Death. Wednesday Search Challenge (12/25/13): A Christmas coronation... and big data? It's Christmas Day, and my thoughts turn historical. But probably not in the way you'd think. Because it's a big and important celebration day in the Christian world, it was once also used to mark extra-special events in Christendom. No, this image won't help you answer the question. I've modified it to be evocative, but not useful. As is usual with cross-cultural search challenges, this one was very difficult. But the stalwarts in SRS came through with an answer! Impressive work, team! 1. What's the Japanese term for a publisher taking a writer out of their normal life and secreting them away in a hotel until they've completed writing the book that they're obligated to write? The practice is referred to as kanzume (say "kahn-zoo-may" for approximation. 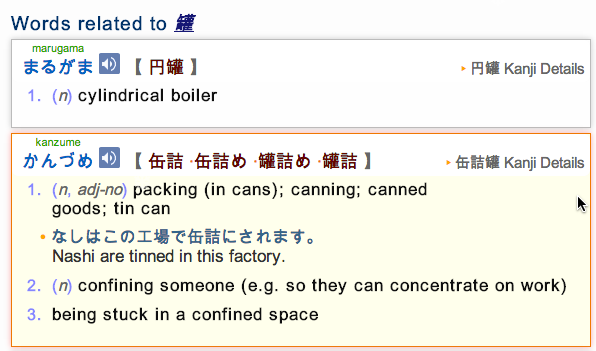 It literally means "canning" or its product (as in sardines, beets, and tuna). A more up-to-date cultural translation may be "vacuum packed." 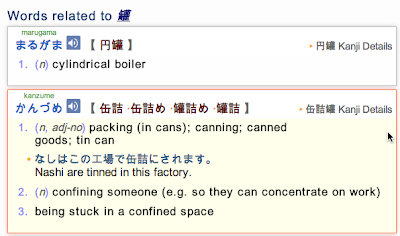 The collocation is kanzume ni naru (i.e., to become canned; literally, to reach a point of being put into a can). Let's look back at the comments to see the thread of how we solved this problem. People searched in blogs, in News, and in Books. The fundamental problem here is that the searcher is trying to figure out what English words are going to be associated with the Japanese word / words / phrase on a web page. Ideally, you'd like to find a dictionary, maybe even a reverse dictionary from Japanese to English. To make things worse, the challenge is a fairly sophisticated one. Whenever you see something like this (that involves high culture, social transactions, and something that's apparently slightly transgressive), there's a VERY good chance that the word/words/phrase will be idiomatic or metaphorical. For instance, if I was to ask you for a common English phrase for being fired from a job, you might say "he's been canned," right? Of course, the action of putting into a can is metaphorical. And that's the issue we have here. How does one look for this kind of thing? There are really two approaches. 1. Try to guess the analogous descriptive phrase. That's what we see in the above list of queries. Searchers are trying to guess what the co-located description of the concept is. 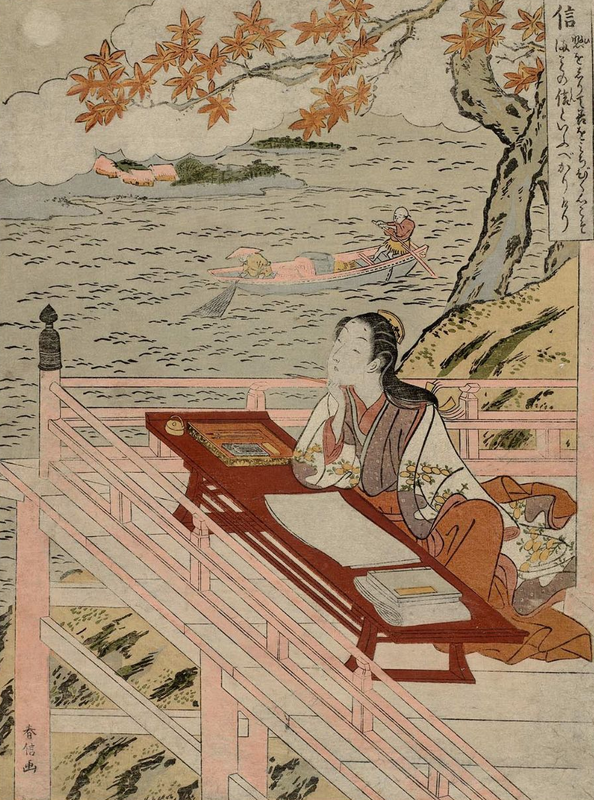 "If the pages are not ready, the editor must sometimes resort to kanzume ("canning"), corralling the artist and confining him to his hotel room until he finishes the pages." but it's true--in such difficult cross-cultural cases, you're often searching around for something that mentions the word/words/phrase near by the English words used. That's why I went to Books to focus my search. I was counting on someone writing a sentence like that in English, and then giving the Japanese term. Mari described how the word kanzume works, and gave me a bit of the backstory on the concept. That kind of first-hand evidence from a person in-and-of the culture is absolutely the best. Slight Warning: If you search for the word kanzume in isolation, you might end up with some slightly risque images on your desktop. It turns out that Kanzume Goddess is a "deck-building" card game that's done in a manga style. The lead character is a young woman who wears squarish glasses... and very little else. And, FWIW, the game itself comes in a can. Search lessons: There are a few lessons here. 1. For cross-cultural searches, people from that culture are the experts. And, given the nature of social media, it's usually pretty easy to find experts inhabiting online discussion boards and lists. Remember also that many libraries have "cultural experts" who can easily answer questions like this. Remember too the "Ask a Librarian" feature is still available to you. 2. For complex, underdetermined questions that are trans-language, Books are your friend. Think about what kind of books would have the information you seek (in this case, a side-comment explaining the concept and giving the Japanese language term), and then search inside of them to find the explanatory quote. 3. Onen you have the word/words/phrase confirm your finding by looking for other examples and definitions. After all, you've got the word itself, at least in the English-form. It's easy to check for its appearance elsewhere. In this case, the problem is to find a defining page (such as a Japanese-English dictionary), or a page that discusses the idea (such as a Wikipedia page, although probably in Japanese). Looking at definition two shows us the sense of the word we're looking for in translation. Side comment: Why didn't I search for something like [ Japanese English dictionary kanzume ] ? I actually did that first, but found the results weren't as high of quality (too many dictionaries in the SERP that did NOT have the word kanzume in them. So I took out the [ Japanese English ... ] part of the query to focus more on definitions. 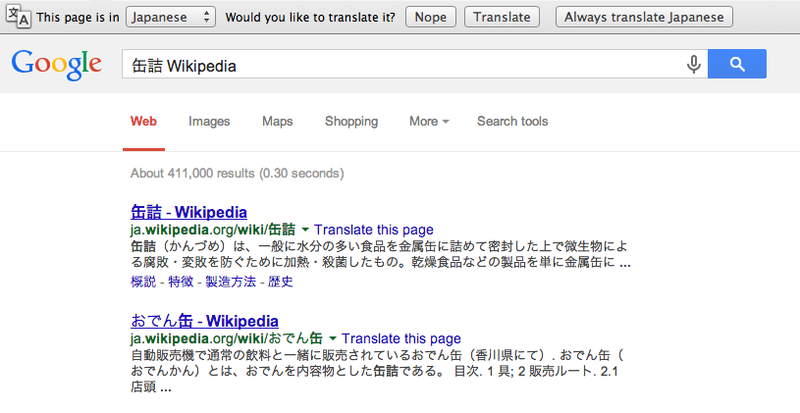 gives us a link to the Wikipedia entry in Japanese. In this case, it's clear that the first hit (even if you don't read Kanji) is the correct one. And with this method, I'm convinced that we have a good result for the challenge. 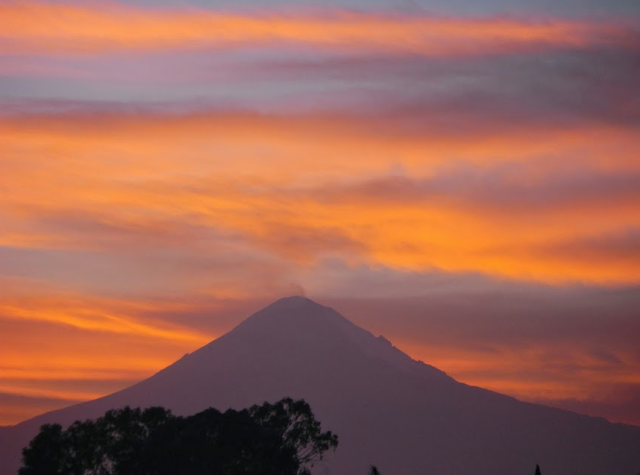 Popocatépetl Resurgent: How do you know when you’re done with your search? We found some credible sources that told us that the lahars reached the base of the Great Pyramid. But then Ramón discovered the work of Patricia Plunket. “Repeated volcanic disasters in Prehispanic time at Popocatépetl, central Mexico: Past key to the future?” Claus Siebe, et al., Geology, v. 24, p. 399-402 (May, 1996). In this paper, the authors argue that a large eruption flooded the area around the Great Pyramid on Cholula with lahar outflows. (Remember that lahars are rivers of superhot mud, rocks, and generally nasty stuff that can travel up to 50 miles from the original volcano at speeds of up to 90 mph. "Our investigations indicate that a major cataclysmic eruption occurred at Popocatépetl at about this time, affecting a minimum area of 3000 km^2. In addition to the volcanic hazards associated with the base surges, pumice falls, and ash flows, widespread volcanic mudflows reached the base of the great pyramid of Cholula (Figs. 1 and 3). The sequence of volcanic mudflow deposits is several metres thick and contains abundant pumice, pottery shards, obsidian artifacts, and carbon. Carbon from this sequence at Cholula yielded an age of A.D. 790 (+/- 175)." Claus Siebe, also wrote a few more papers with this same claim. 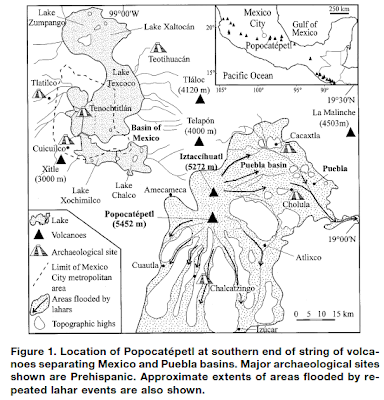 Sheridan, M.F., Hubbard, B., Bursik, M.I., Siebe, C, Abrams, M., Macias, J.L., and Delgado, H (2001) “Short-term potential volcanic hazards at volcan Popocatepetl, Mexico” EOS, American Geophysical Union, 82:185-189. Siebe, C., & Macías, J. L. (2006). “Volcanic hazards in the Mexico City metropolitan area from eruptions at Popocatépetl, Nevado de Toluca, and Jocotitlán stratovolcanoes and monogenetic scoria cones in the Sierra Chichinautzin Volcanic Field” SPECIAL PAPERS-GEOLOGICAL SOCIETY OF AMERICA, 402, 253. But it’s interesting to note that the text used to describe the 822 AD lahars reaching the foot of the Great Pyramid in Cholula is exactly the same each time (suggesting that the text was simply copied from paper to paper without any newer data). Then there is additional work that agrees with this that we’ve already found. http://volcano.oregonstate.edu/vwdocs/volc_images/north_america/mexico/popos_potential.html Written by Michael Abrams, Volcanologist, NASA/Jet Propulsion Laboratory, Pasadena, CA. But writing on the Oregon State “Volcano World” web site, Department of Geosciences at Oregon State University. Abrams is a co-author on a paper about Popo that was written by M. Sheridan (who is at SUNY Buffalo, NY). The downside of this web document is that it’s just a note, not an official publication. There are no references, etc. But it seems reasonably believable. As we see, the author comes from a credible institution and has good credentials in this area. Google Search [ Popocatepetl caldera formed ] and find a book "Geology of México: Celebrating the Centenary of the Geological Society of México" pp 199-201 Page 201 has a great timeline/stratigraphic image of past eruptions. I go back and try to find another source for flow reaching the pyramid [ pyramid cholula 850..700 lahar ] but the range search but the range search doesn't appear to work in reverse, so [ pyramid cholula 700..850 lahar ] to and discover the Mesoamerican Research Foundation. The Google Quick Scroll extension leads me to this passage: "NOTE: Beginning in 1993, scientific studies find that volcanic activity has produced several eruptions, two of which were the most violent. The first was, ''at the beginning of the present era'' or first century A.D. The second was, ''between A.D. 700 and 850.'' (Plunket & Urunuela 1998)." I repeated Fred’s search for [ Plunket & Urunuela 1998 ] and found the PDF for the paper. Plunket, P., and G. Uruñuela. "Mountain of sustenance, mountain of destruction: The prehispanic experience with Popocatépetl volcano." Journal of Volcanology and Geothermal Research 170.1 (2008): 111-120. This paper talks about the artifacts and radiocarbon dating of artifacts found at the site suggesting they were covered sometime between 700-900AD. “Excavations on the campus of the Universidad de las Américas to the east of the Great Pyramid have demonstrated that, in areas where stratigraphy is intact, lahar deposits are also absent although a sterile layer of sandy volcanic ash consistently seals the black clay deposits of the Classic period; cultural materials overlying this layer belong to the Early Postclassic (Plunket and Uruñuela, 2005b, p.103)." SO… What have we found here? We’ve found that the story isn’t quite as cut and dried as I thought. The Siebe crowd believes that the evidence is quite clear that the lahar flow of ca. 800 AD reached the based of the Great Pyramid. The Plunket crowd disagrees. We are in the middle of an old-fashioned scientific disagreement, with evidence being mounted on both sides. I’ve spent about 8 hours quite happily reading through the literature of volcanoes and archaeology in the area of Puebla and Colula. It’s been hugely fun, but in the end, both groups are arguing about whether or not the lahars made it all the way to the Pyramid or not. Well.. THAT’s hard to check out! Panfil, Maria S., Thomas W. Gardner, and Kenneth G. Hirth “Late Holocene Stratigraphy of the Tetimpa Archaeological Sites, Northeast Flank of Popocatépetl Volcano, Central Mexico” Geological Society of America Bulletin 111(2): 204-218 (1999). And so it goes, back and forth. Plunket (an archaeologist) disagrees with Siebe’s (the geologist) interpretation of what’s seen at the pyramid site. Is it a mud flow from the volcano? Or just the melting of adobe bricks over the years down onto the plain? I don’t think we’re going to be able to figure this out by just web searches. This is really a case where we now understand that there is evidence for, and evidence against. We could read through all of the literature and make a reasoned guess at the evidence, but that’s the job of a geology (or archaeology) graduate student. Note that this kind of conversation happens ALL the time in the Talk pages of Wikipedia. You can see this even in something as innocuous as the Wikipedia page on Chocolate. If you read the “Talk” page for Chocolate, you’ll see an animated debate about what should go into the article on chocolate, even reaching into politically charged topics such as child slavery! And, of course, this kind of open debate about evidence and conclusions is just the normal operation of science. Even in fields where the “standard interpretation” would seem to be fairly stable, new interpretations arise, sometimes by people from outside of the field. See, for instance, Nathan Myhrvold’s critique of growth rate data in dinosaurs in which he questions the well-accepted data and analysis of how quickly dinosaurs grew. (NY Times article) and his own publication site, which reprints an article he authored in PLOS One (a fairly respected online with peer reviewed articles, but are not excluded on the basis of lack of perceived importance or adherence to a scientific field). And of course we should note that some “discoveries” aren’t QUITE that… See the article about the re-discovery of the anterolateral-ligament (ALL) for a discussion about how the ALL was “re-discovered” (but really wasn’t). FWIW, I first saw this in the NYTimes Magazine (“A team of Belgian doctors recently confirmed the existence of a new ligament in the human knee…”) 12/8/13, and when I checked on it, the story had pretty clearly been blown up out of proportion. Search lesson: Overall, then, the key search lesson from our Popo adventure is that it’s well worth looking around a bit more after finding your initial result. Discoveries are often not what you think when they're first noted. Subsequent articles frequently update recieved knowledge. Hint: Look for variations in the answers; and sometimes, just sometimes, you stumble into a very fun debate. And we realize once more that not all of science and history is quite as locked-down we'd thought. Sometimes you really have to go beyond just a simple lookups of facts. MANY THANKS to the SearchResearchers who pointed out the alternative interpretations of the "lahar" flows around the Great Pyramid in Cholula. Special shout-out to Ramón and Fred, who went the extra mile to contact the authors of some of these reports and dig more deeply into the topic. Continuation: What's that word again? Answer: When did the outflow reach the pyramid?